Before there were computers, before typewriters and ballpoint pens and even fountain pens, there was the inkstand. 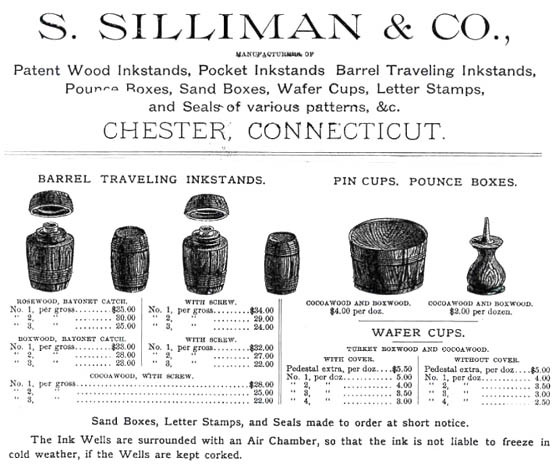 In the 1800s, the S. Silliman Company in Chester made itself known nationwide for its wooden inkstands and inkwells. Indeed, it is said that Abraham Lincoln had a Silliman inkwell in his Springfield, Illinois, law office, and in 1837 a Silliman inkwell was gifted to President Martin Van Buren. The Chester Historical Society invited longtime collector Tom Marshall to talk about his knowledge of Silliman products in February 2017 at the Chester Meeting House. A tape was made of the program. Please watch it here. Additionally, the Society's collection of Silliman artifacts is now a major feature of the Streams of Change exhibit at the Chester Museum.